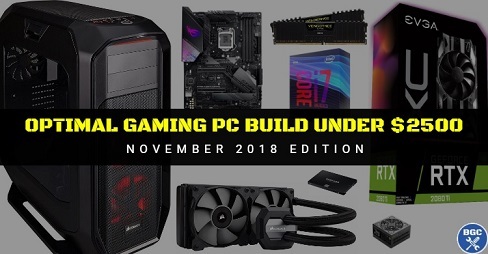 Stay in the loop as a PC builder: every time we publish updated or new guides, builds or tutorials, we'll post it here. How to maximize gaming performance from a $1000 build by making smart bang-for-buck component selections. 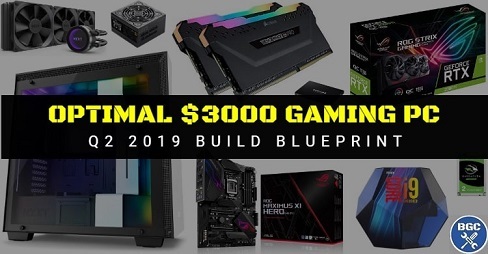 This quarter our recommended 1K custom setup switches from the i5-8400 to the newer, slightly faster and cheaper 9400F (we'll also explain why it costs less) as well as getting a better motherboard and all-new case recommendation. Our sample 1200 US dollar build has undergone a major overhaul from the previous recommended one, with this Q2 2019 edition sporting a slick red and black theme and other improvements These are the parts we can safely recommend to gamers in 1440p looking for excellent performance, or for those running 1080p 144Hz monitors and wanting to get some seriously high frame rates thanks to the fairly powerful i5-9600K and RTX 2060 combination. It's also a beginner-friendly setup for overclocking. Our sample 1500 dollar parts-list for 1440p stays the same this quarter besides a couple of aesthetic improvements to really hone in on a matching white theme. These hardware components are a great value mix and all you need for excellent 1440p gaming performance. The included AMD Ryzen 2700X processors means excellent multitasking/productivity performance, too. This quarter's recommended 2K rig changes a little this time around, with a better value for money air cooler as opposed to our previously recommended liquid cooler, which is the best way if not overclocking or doing mild overclocks. This frees up some of the budget for a faster RTX 2080 card than our previous $2000 build. For those interested in nitty gritty details, join our email newsletter where we explain exactly what changes in all our builds with every update that we do. We've made a few tweaks to our recommended 2500 dollar custom setup, although only aesthetically and the core parts remain the same as nothing really beats an i7-9700K and RTX 2080 Ti combination when building a computer in this price range. 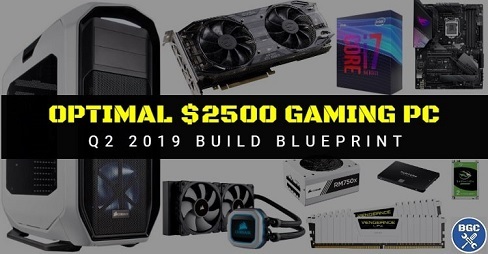 For the first time in our short site history - we've been around for a long time but not really in the grand scheme of things as the internet has believe it or not only really just begun - we've published a recommended PC build for 3000 bucks. $2500 was our limit until now, but a few of you guys have requested even more extreme setups in recent times, and we're happy to oblige and share our thoughts on how to stretch such ludicrous amounts of moolah. Yep, that's right, 3K for a gaming rig. Freakin' overkill indeed, but there are those elite 1-3% of pro gamers out there who wouldn't really settle for less than the absolute best. Anyway, this is how we'd go about choosing the best parts on the market to assemble the ultimate gaming machine in the galaxy. 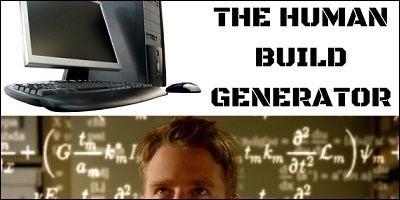 Many bothans died to research, craft and fine-tune our all-new comprehensive no B.S guide to buying the right router as a gamer and/or streamer. This one has been in the works behind the scenes for a long time now (months), but I didn't want to rush it and wanted to get all the details right (there are many) including the very carefully-considered top router recommendations for 2019, and also creating something that's as helpful as possible as there's a lot of misinformation online about buying a router that just adds to the confusion and I did not want to just add to the noise. Hopefully it helps someone out there with this tricky purchase. 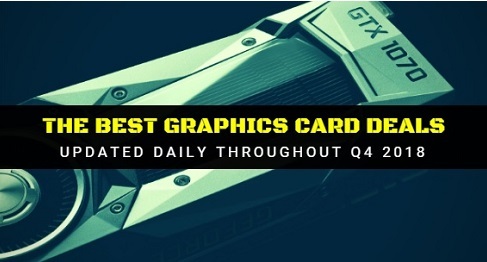 Our periodical analysis of the best graphics card deals for gamers that we can find gets another update, and this time there's quite a few decent deals on budget/mid-range cards from AMD, as well as a couple light deals from team green. Tri-band routers aren't for everyone, but for homes with heavy internet usage they can come in handy as you can allocate more coverage and speed (or even an entire one of the 3 bands if you want) to what matters most: gaming. The top models also come with special features to maximize throughput, range, speed, and to help lower enemy numero uno as an online gamer: ping. Quick heads-up on our builds as some of you have been wondering when the March update will be finished for our recommended custom PC builds. We've decided there's no need to update the builds in March, and our current February builds still apply as a roadmap if you're planning a build this month. PC hardware changes quite quickly, but not that quick, and from month to month most of the builds often don't change too much (if at all). That's why from now on we'll be doing quarterly builds (as in every 3 months) for the forseeable future, so the next builds update will be around April or even May. We've been doing monthly builds for what feels like forever now (many, many years) and it's been a great success based on your feedback over the years (thanks to everyone who has ever supported the site whether in a big way or small; much appreciated and the site wouldn't still be around today without some of you guys sharing the site and supporting it in other ways). We feel quarterly build updates is a better time-frame for both you guys and for us here at BGC: 3 month updates is still frequent enough to cover any noteworthy changes to the market, but it also increases the time we can dedicate into updating all our many other supporting guides (which take a ton of time, too) and in creating all-new guides on other PC building related topics. Thanks guys, happy building, and look out for many new guides coming this year! It's gonna be a game-changing year for BGC. PS - We've just started actually posting on the Twitter page we created last year so follow us there for updates too. Modem routers aren't for everyone, as some gamers will either want or need to use a separate modem with a separate wireless router as well, but if you want/need a combo device to kill 2 birds with one black box this guide is here to help you better navigate the confusing modem router market. 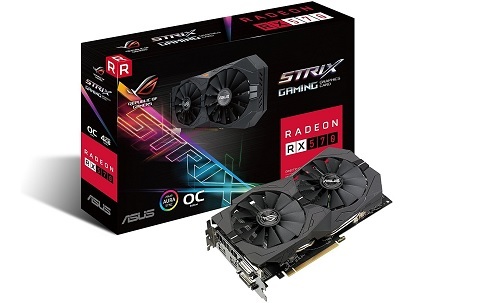 We took a short hiatus on tracking GPU deals, as to be honest in January there wasn't too much to get excited about, but right now in mid February there are some decent savings to be had in a few different price categories. 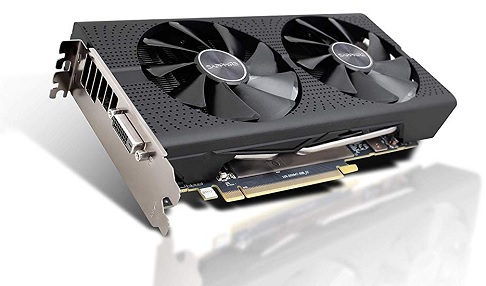 Standout GPU deals at the moment are super-cheap RX 570's, specifically Sapphire mining cards which are still just fine for gaming PCs so long as you have a DVI input on your monitor or you buy a DVI to HDMI adapter as these GPUs only have a DVI connection (and you don't mind not having AMD Freesync which is a fair trade-off for getting a 570 at such a bargain price). Our latest build lineup showcasing our latest recommended PC parts for any spending budget is finally complete. This month's update has been a long time coming as we skipped the January update in order to give all our build guides a bit of a makeover. Our February recommended builds include a few changes, with the most notable being the obvious choice to replace the GTX 1070 and 1070 Ti cards from the best $1000 and $1200 builds for the new RTX 2060, but the biggest update to our builds (and the reason for the delay) is our all-new hand-picked recommendations for builders in Canada, UK and Australia. What should you choose when adding wireless to your desktop build? An internal WiFi card or a USB dongle? Let's discuss everything you'd ever want to know about including wireless capabilities into your new PC build, including a full breakdown of which is better for online gaming, which speed you need, internal vs external antennas, and more. Our top 3 recommended PCI Express expansion cards to add wireless to your build, or when upgrading a prebuilt desktop. These carefully considered models represent the best overall value (IMHO) for 3 different price tiers, and deciding between them comes down to how fast your router and internet connection actually is. Included is an FAQ on PCI network cards. 5 of the best overall value for money USB adapters if you want to add WiFi to your PC build but would rather have an external adapter instead of installing a PCI expansion card (or instead of buying a motherboard with built-in WiFi). We also cover what to look for in a good USB adapter including what all the specs mean. We've just reintroduced our done-for-you parts-list planning service where you can get dedicated 1 on 1 help with choosing the optimal parts list for your exact budget and gaming/workstation performance needs. This isn't for everyone, but if you want a longtime hardware expert to carefully and thoroughly research your build for you, this might be the service you need to give you the confidence to build your first PC and avoid confusion and fear surrounding buying average, incompatible, or overpriced parts. 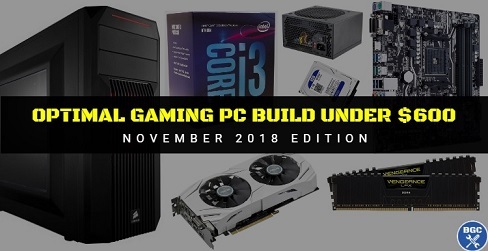 Over the past couple weeks we've done a full update to all our gaming PC builds ready for the late December holiday period. Black Friday and Cyber Monday are now a distant memory but that doesn't mean tech deals stop cold turkey, and you can expect price drops and the occasional standout hardware deal throughout the Holiday season. Since video cards are not only the most important component to a new gaming build or upgrade, but also the most expensive, we're tracking GPU deals on a daily basis throughout the whole of December just like we did in November to help you buy a discounted card for your rig. 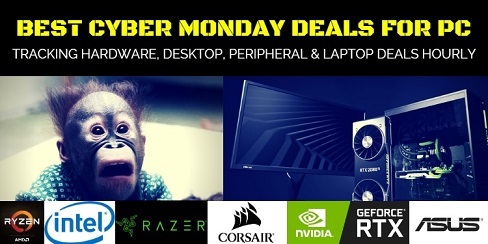 Just like Black Friday, we're obsessively tracking the top deals throughout Cyber Monday morning and afternoon (by nighttime the best ones will undoubtedly be gone) to help you avoid missing out on great bargains for your new PC build or upgrade. The first wave of deals today look seriously great without any exaggeration, and today's the perfect day to build a discounted rig. 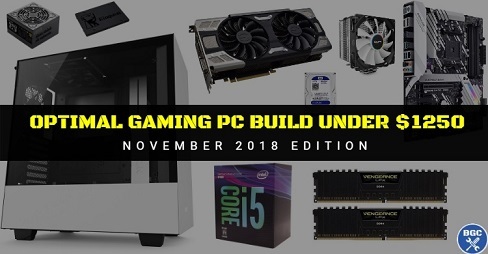 Black Friday and Cyber Monday are the best days of the year to build a PC, period. 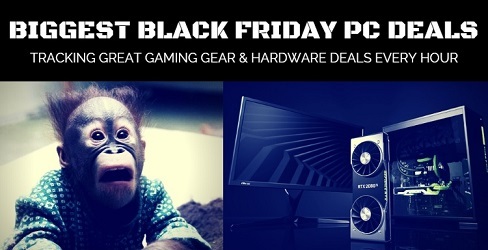 But finding and sorting through the many PC related deals out there today and throughout the weekend sales bonanza can be confusing and a little overwhelming if you don't know what to look for. 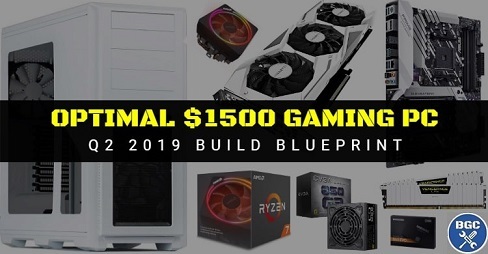 Here we try to simplify things and pinpoint the very best, high-quality deals on PC components and gaming gear that are actually worth considering for your PC build and that we would actually buy ourselves. Good luck! How to choose the best bang for your buck parts on the market right now to easily put together a simple yet killer value for money gaming PC that trounces modern day consoles and allows for much smoother 60FPS performance than your typical 30FPS experience on console. This cheap rig may be all you need for solid 1080p gaming if you're gaming on a 60Hz monitor and don't need crazy high frame rates and you don't mind turning down the settings on the most demanding games (although it'll run many AAA games really well on high or even ultra settings as well). 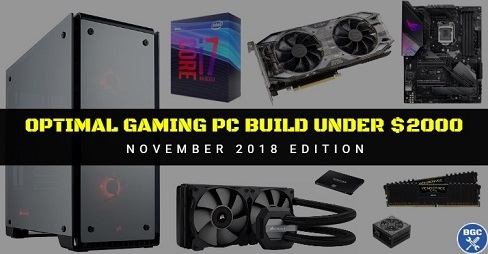 Building your own setup will save you the most money and is what we recommend to all gamers even if you're a complete hardware noob who doesn't know what a GPU is. However some gamers don't have the time, patience, or interest to learn how to do it and in that case you're best off leaving it to a pro. These are our current top recommended PC builders with good reputations for reliable, fair-priced and good-quality gaming PCs. Whilst the majority of you guys are building PCs primarily for gaming, we understand a healthy portion of you are content creators or professionals building more workstation-oriented PCs instead and we've got your back, too. 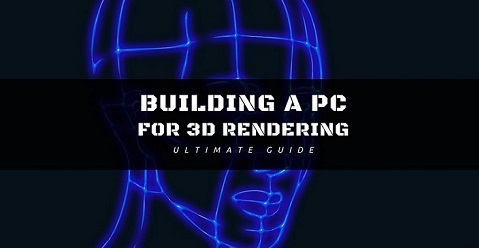 In this guide we cover everything related to building an optimal 3D production and rendering rig, which has undergone an update for the late 2018 market to take into account newly released hardware. Our processor buying guide for gamers has been given an update to accommodate for recent CPU releases from Intel, namely the 9600K, 9700K and 9900K, which all now make our list of top recommended gaming CPUs for PC builds in late 2018. Intel can't be beat in the upper echelon, especially for extreme 144Hz builds where you need to crank out as many frames as possible (and is where Intel shines as they have better single threaded performance), but AMD makes our top recommendations in the budget and mid-range tiers. If you're new to the CPU world, this is the simplified beginner's guide that'll get you up to speed. 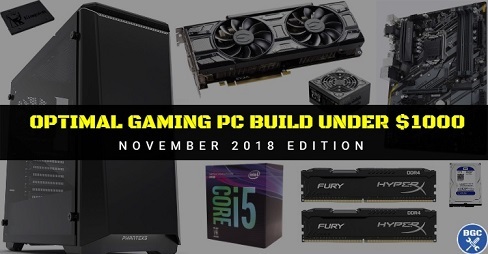 The 600 dollar recommended PC build for gamers stays the same as last month's build except for a small change in video card model from the EVGA single fan model to the currently better priced Asus dual fan model which is also overclocked out of the box for slightly faster performance. This guide explains how to stretch a modest $600 budget based on the current hardware market to build the fastest gaming rig possible to get 60FPS on high/ultra in most games in 1080p. We've tweaked our VR hardware guide with a few improvements such as including the new RTX GPUs so that it's now up to date for the late 2018 market. If you're looking to get into virtual reality on PC and want a 101 primer on how to get started, choosing the best PC VR headset, and what hardware you're going to need, this is the guide for you. 2019 could very well be a game-changer for VR with some very exciting titles to be released. 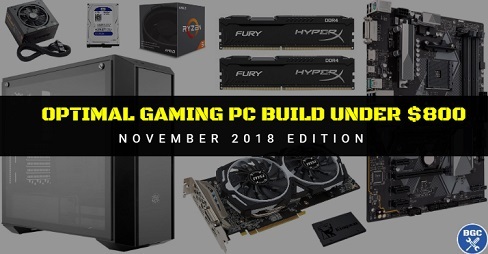 As we continue our meticulous re-evaluation of all our gaming build examples in time for the epic Black Friday and Cyber Monday weekend of hardware sales that is to come, the next pit stop is our $800 build. This month we ditch the GTX 1060 6GB for the currently better value RX 580 8GB, which you can find at a super attractive $200-220 price tag right now. 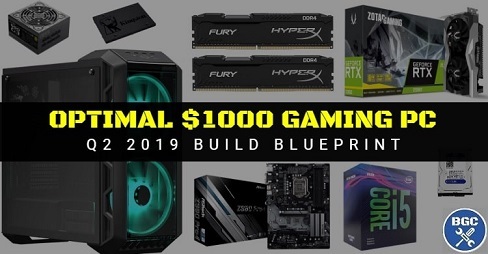 Unlike some of the other tiers this month which have been totally revamped with new hardware recommendations, our suggested 1000 dollar build stays essentially the exact same albeit with a simple change in GPU model. An i5-8400 and GTX 1070 combination is hard to beat in terms of pure bang for your buck as a gamer, especially if you find a good deal on the 1070 which is quite easy to do at this point in time with price cuts happening on GTX cards left right and center. 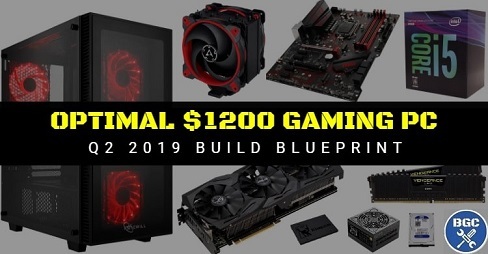 This month we've introduced a new $1200 price tier which shows how to utilize a budget of this amount to maximize gaming performance when building a PC in November. This amount allows for an impressive i5-9600K and GTX 1070 Ti gaming build for those either gaming in 1440p 60Hz or 1080p 144Hz, and is one of our overclocking-friendly builds as well with the unlocked i5 processor and decent aftermarket CPU cooler. 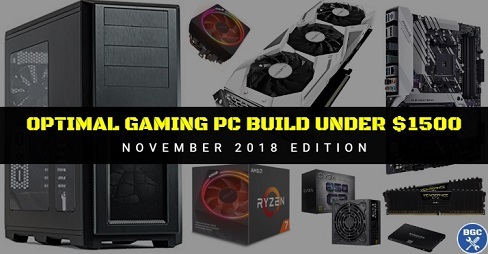 For this month's recommended 1500 custom gaming PC we've introduced an all-new high-end AMD gaming build, as the value of the 2700X CPU is hard to ignore and it makes a great alternative to an i5 or i7 and also makes for a very future-proof and well-balanced rig (in terms of performance as its an amazing multitasking chip). This build also features the all-new RTX 2070 graphics card, which is the new best pick right now around the mid to high-end GPU range, and represents the best overall value within the latest RTX releases when compared to the overpriced 2080 and 2080 Ti. 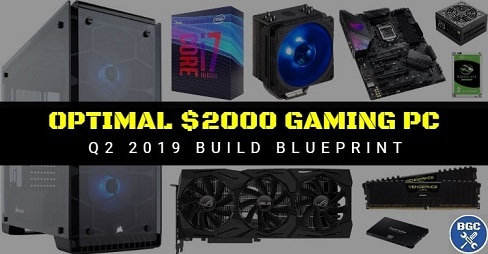 We've complete our full monthly update of our current suggested $2000 parts-list, which explains how we'd currently spend a budget of this amount based on the current hardware market to get the most bang for the buck as a gamer. Most of the parts stay the same but this month we introduced an all-new awesome case for this build tier. This custom gaming PC is recommended for either flawless 1440p gaming performance or very respectable 4K and VR performance. 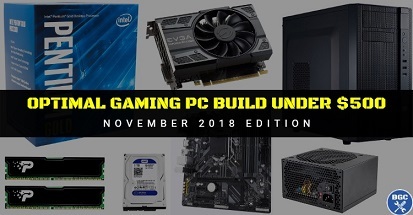 We kick off the full November tweaks of our monthly-updated recommended PC builds for gamers with our current recommended $2500 gaming PC build which includes the latest RTX 2080 Ti graphics card, the newly crowned king of single gaming GPUs, as well as the latest and greatest Intel i7 processor. The specific custom parts-list in this guide is exactly what we suggest right now to maximize a healthy PC budget of this size based on the current market. The new RTX 20 series cards have been released by NVidia which means price drops on the 1080 Ti, 1080, 1070 Ti and 1070. 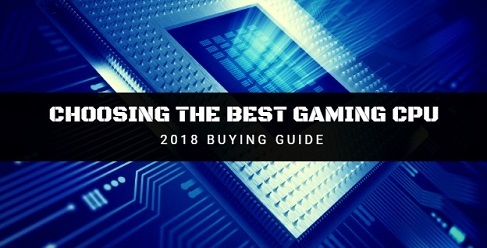 If you can't afford the slightly overpriced price tags of the new RTX cards and would rather get a cheaper current-gen card (which aren't going anywhere soon and are still good buys) to maximize gaming performance for every dollar you spend on your new build or upgrade, here we're tracking the best deals we can find from Amazon and Newegg on the previous 10 series. Building your very first custom setup and need a full roadmap? We've run this site for many years now, helping countless first-timers take the fun leap into DIY for the first time, but we've never had an A to Z step by step guide covering everything from scratch all in the one place. As in, not just building your PC, but planning it from absolute scratch and understand hardware basics as a complete beginner. This changes now, and this guide will take you by the hand through absolutely every step that it takes. 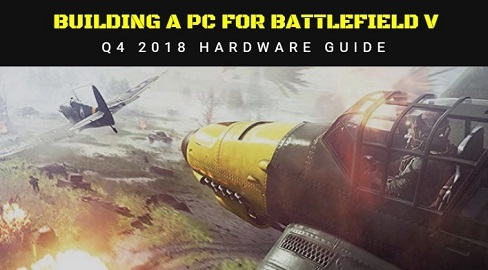 Whether you're planning a new build and wondering which settings you should aim for and base your hardware choices around, or whether you have already built your system and looking to tweak performance, this beginner's guide to graphics settings covers all the basics including a look at whether you really need ultra settings, which settings affect FPS the most, which are most CPU intensive, and more. What's the Best Resolution for PC Gaming in 2018? 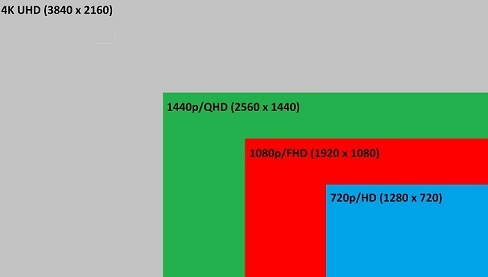 A newbie guide to the most popular resolutions for gaming in 2018 and which to choose for your new custom build and monitor, inluding optimal resolutions for the specific graphics card that you choose and our thoughts on 1080p vs 4K. The resolution you choose has a great bearing on the performance you'll get, and ultimate on how much you need to spend on your PC. This November EA and Dice launch the latest Battlefield which promises to be a great WW2 single and multiplayer FPS, with a much anticipated Battle Royale mode to be released later down the track too. In this guide we'll explain the system requirements, how demanding the game is, and tips on upgrading or building the right system for good performance in this game. Note: Older articles can be found in our Archives section. Also keep in mind we sometimes delete outdated articles if they're no longer relevant and/or helpful. Btw, if you see an article on the site that's old and useless, and either badly needs an update or should be deleted, please let us know. We wish to keep the whole of the site as current and helpful as possible. Cheers.